T. S. Luke, Ushering in a New Republic. Theologies of Arrival at Rome in the First Century BCE, Ann Arbor, 2014. The ancient Romans are well known for their love of the pageantry of power. No single ceremony better attests to this characteristic than the triumph, which celebrated the victory of a Roman commander through a grand ceremonial entrance into the city that ended in rites performed to Rome's chief tutelary deity, Jupiter Optimus Maximus, on the Capitoline hill. The triumph, however, was only one form of ceremonial arrival at the city, and Jupiter was not the only god to whom vows were made and subsequently fulfilled at the end of a successful assignment. 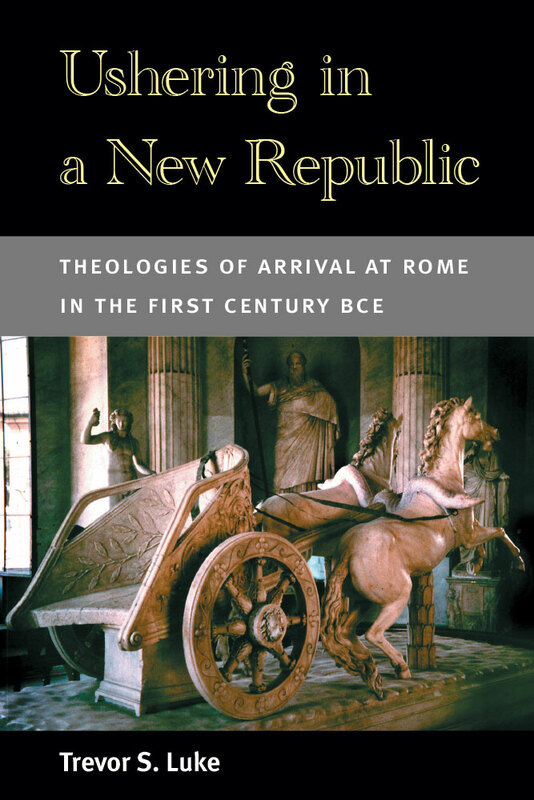 Ushering in a New Republic expands our view beyond a narrow focus on the triumph to look at the creative ways in which the great figures of Rome in the first century BCE (men such as Sulla, Caesar, Augustus, and others) crafted theological performances and narratives both in and around their departures from Rome and then returned to cast themselves in the role of divinely supported saviors of a faltering Republic. Trevor S. Luke tackles some of the major issues of the history of the Late Republic and the transition to the empire in a novel way. Taking the perspective that Roman elites, even at this late date, took their own religion seriously as a way to communicate meaning to their fellow Romans, the volume reinterprets some of the most famous events of that period in order to highlight what Sulla, Caesar, and figures of similar stature did to make a religious argument or defense for their actions. This exploration will be of interest to scholars of religion, political science, sociology, classics, and ancient history and to the general history enthusiast. While many people are aware of the important battles and major thinkers of this period of Roman history, the story of its theological discourse and competition is unfolded here for the first time.